Garmin eTrex Legend — The BEST GPS With the eTrex Legend, Garmin has loaded a full basemap of North and South America into one small unit. The Legend is also designed to provide precise GPS positioning using correction data obtained from the Wide Area Augmentation System (WAAS). This product will provide position accuracy to less than three meters when receiving WAAS corrections. The basemap contains lakes, rivers, cities, interstates, national and state highways, railroads and coastlines. 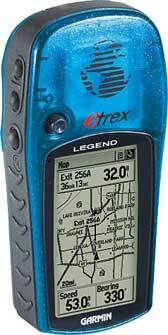 The eTrex Legend is also equipped with additional memory totaling eight megabytes. The added memory allows the eTrex Legend to accept downloaded map data from Garmin's entire line of MapSource® CD-ROMs, including Fishing Hot Spots®. The eTrex Legend comes in a brightly-colored translucent blue case that really makes the unit stand out. New to the product design, Garmin will include marine aids to navigation in addition to the basemap. These navigational aids will be pre-loaded into each unit from the factory. Magellan SporTrak Color SporTrak Color provides superior tracking and accuracy, showing your position to within 3 meters, even in difficult environments such as cities or mountains. Featuring an impressive 10 MB North American, built-in mapping database, SporTrak Color puts rich color maps at your fingertips. The large, high contrast, full color 240 x 160 pixel display enables you to easily find your location, heading and route. An additional 22 MB for North America of memory enables you to expand your mapping capabilities by uploading detailed maps from optional Magellan MapSend® software products. A clear advantage over the competition, SporTrak Color also offers a built-in barometer, giving you an advance on the weather and an innovative 3-axis compass for superior navigational accuracy no matter how you hold it. Built tough, SporTrak Color is waterproof and rugged enough to go with you on any adventure. See where you are and where you’re going in vivid color on a large 240 x 160 pixel, high contrast, full-color display. Color enables you to easily see your location and route, and to easily differentiate between roads, interstates, parks, waterways, airports and other Points of Interest at a glance. Like carrying your own little weather station, there’s no need to worry about what might be rolling in. A clear advantage over the competition, SporTrak Color offers an innovative 3-axis compass which orients no matter how it's held, providing added confidence. You don't need to hold the unit level like a compass or a 2-axis electronic compass (found in many GPS devices), to get an accurate reading. Hold it naturally. The SporTrak Color uses WAAS (Wide Area Augmentation System) and the European Geostationary Navigation Overlay System (EGNOS) to provide the maximum GPS accuracy and reliability available. Tracking up to 12 satellites to locate your position to within 3 meters, you can rest assured that with the SporTrak Color, you will know where you are. An intuitive interface and keypad provide direct access to key features, putting the power of GPS at your fingertips. Start navigating right away with the impressive, 10 MB, built-in mapping database of North America, including highways, major roads, parks, waterways, airports, cities and marine navigation aids, such as buoys, beacons, lights and more. Easily expand your mapping capability by downloading detailed maps from optional Magellan MapSend software products. Nine customizable graphic navigation screens include a map, compass and speedometer with text readouts of heading, bearing, speed, direction, ETA, and more. Choose from 12 built-in coordinate systems and 76 datums including Latitude/Longitude, Universal Transverse Mercator, and Military Grid Reference System. Garmin GPSMAP 76CS The latest color-display technology gives the 76CS the brightest, sunlight-readable displays available. And with brand-new state-of-the-art receivers and powerful microprocessors, this unit will give you a quick and steady fix. In addition, the GPSMAP 76CS boasts a built-in electronic compass and barometric altimeter. Both the Garmin 76C and Garmin 76CS have the familiar GPS 76-family keypads and styling, with 115 MB of memory, an Americas Autoroute basemap, and a Marine Point database. Fast USB connectivity makes loading charts and maps quick and easy, while navigation instructions can be shared with repeaters, plotters, and autopilots using NMEA protocols through the dedicated serial port. They’re waterproof and fully compatible with MapSource® products like BlueChart®, U.S. Topo 24K, and City Select® (which provides detailed streets for turn-by-turn guidance). Compatible with most MapSource products including BlueChart, City Select, U.S. Topo 24K, U.S. TOPO, and Recreational Lakes with Fishing Hot Spots. Garmin eTrex Legend C The eTrex Legend® C is Garmin's exciting, new, pocket-sized handheld that brings color, automatic routing, longer battery life, plus more to our popular-selling eTrex Legend. You won't miss a thing when you take this colorful, lightweight, easy-to-use handheld out hiking, biking, boating or even geocaching. The eTrex Legend C along with the eTrex Vista C are Garmin's smallest, least expensive products to combine a color TFT display and advanced GPS routing capabilities in a waterproof design. Of course the eTrex Legend C still includes those popular features that users have come to love and expect in the eTrex product line, such as a compact, lightweight, waterproof design and user-friendly interface. The eTrex Legend C is WAAS-enabled, and like all eTrex units, the primary controls are oriented on the side of the unit, so the user can conveniently operate it with one hand. Also, an innovative rocker switch is located on the face of the unit that enables the user to input data easily, scroll through menus, or pan the map page. Lowrance iFinder Plus Personal, precise, powerful, pocket-size, iFINDER® mapping GPS/WAAS navigation with digital recording, expandable memory, and unique FaceOffs®. The only way to go with ease and style! Comes with Black FaceOffs® cover. Also available with the Plus package - The iFINDER® Plus has the same great features of the standard model, with the added plus of exclusive MapCreateT mapping software, one MMC/SD memory card, and an MMC/SD card reader with USB connector - for making custom, high-detail mapping. Garmin eTrex Truly a small wonder, the eTrex takes the best features of a 12 parallel channel GPS receiver and put them into a six ounce package that is only four inches high and two inches wide. The result is a unit that will literally fit in the palm of your hand. Besides its small size, mariners and outdoorsmen will likely notice the sleek design of the eTrex. All buttons are located on either side of the unit, allowing for simple, one-handed operation that won't obstruct your view of the display. In fact, the eTrex features only five operator buttons for the ultimate in user-friendly design. Thanks to its bright yellow case, the eTrex will be hard to misplace and easy to find in any boat or backpack. The eTrex is completely waterproof so it can take an accidental splash or dunk in the water and still continue to perform. Inside the eTrex, you will find the proven performance of a 12 parallel channel GPS receiver that will run for 22 hours on just two AA batteries. The eTrex will store up to 500 user waypoints with graphic icons and boasts Garmin's exclusive TracBack® feature that will reverse your track log and help you navigate your way back home. In addition, the eTrex uses animated graphics that will help you identify your marked waypoints quickly and easily. Garmin GPSMAP 60CS The GPSMAP® 60CS and GPSMAP 60C are new all-purpose units-packed with exciting new features and delivering the kind of color that consumers want in their handheld GPS's. These lightweight, rugged, waterproof units raise the bar to offer a 256-color, highly reflective display that provides easy viewing in almost any lighting condition. This transreflective TFT provides excellent viewing while maximizing your battery life (20 hours, typical use). Garmin eTrex Vista The eTrex Vista combines a basemap of North and South America, with a barometric altimeter and electronic compass. The compass provides bearing information while you're standing still and the altimeter determines your precise altitude. The Vista is also designed to provide precise GPS positioning using correction data obtained from the Wide Area Augmentation System (WAAS). This product will provide position accuracy to less than three meters when receiving WAAS corrections. The eTrex Vista also boasts an internal memory capacity of 24 megabytes, which allows it to accept downloaded mapping data from Garmin's MapSource® CD-ROMs, including Fishing Hot Spots®. A silver case gives this unit a high-tech look. New to the product design, Garmin will include marine aids to navigation in addition to the basemap. These navigational aids will be pre-loaded into each unit from the factory. There are as many reasons to take advantage of a compact handheld GPS receiver as there are ways to spend time outdoors. Just a few activities where GPS navigation can come in handy include boating, hiking, mountain biking, snowmobiling, skiing, and off-road driving. In fact, just about any time you need to know where you are, or how to get where you want to be, GPS navigation can help. Imagine you're on vacation, and that you've found the perfect fishing spot along a little-traveled river. You want to go back next year, but how to remember exactly where it is? Simple: mark a "waypoint" in your GPS receiver, and you'll be able to navigate back to that exact location (give or take a few meters) whenever you'd like. And handheld GPS receivers have made possible an entirely new sport: geocaching. It's a kind of high-tech treasure hunt, where players from all over the world hide "caches" in remote locations and post the coordinates online so others can navigate to their hidden treasure. 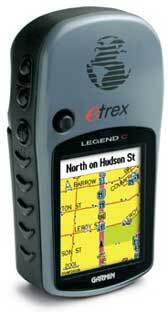 Geocaching has become more and more popular as GPS receivers have gotten more accurate and more affordable. 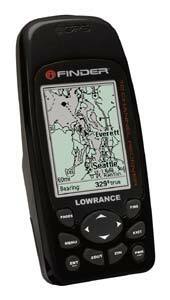 Garmin, Magellan and Lowrance make gps devices of all kinds and they excel in handheld devices. We evaluated Magellan's SporTrak Color, GPS 315, Meridian Platinum and Meridian Color; Garmin's GPSMAP 76CS, 76S, 76, GPSMAP 60CS, eTrex Legend, Legend C, eTrex Vista Color, eTrex Vista, GPS12, eTrex, eTrex Summit, 12 CX, Rino 120 and ForeRunner 201; and Lowrance's iFinder and iFinder Plus. Any of the above units would serve a consumer well, but we wanted the best. Our eight finalist's (selected by our panel of judges) for Best GPS in the hanheld category are — Garmin eTrex Legend , Magellan SporTrak Color, Garmin GPSMAP 76CS, Garmin eTrex Legend C, Lowrance iFinder Plus, Garmin eTrex Vista, Garmin GPSMAP 60CS and Garmin eTrex. The Garmin Forerunner 201 is a winner in its own category - it's held on the wrist, not in the hand.